Touch Of Silver Silver Sensations Shampoo for her professionally designed for grey, white or platinum female blonde hair. Gently cleansing Silver Sensations Shampoo contains Sunflower Seed Extract and UV absorber to help protect against photo damage and safeguard your colour. Whilst Optical Brightener optimises the reflected light to instantly boost shine. This sensational shampoo, brightens and enhances silver tones. Resulting in fresh, healthy great looking hair! I like to use it once every two weeks in conjunction with my shampoo and conditioner as the 2nd shampoo wash. I have seen that it has maintained my hair and kept my blonde hair away from brassy tinges in my hair. I have to admit that even my hair colour dye has helped too keeping my hair a perfect platinum blonde. It isn't a strong shampoo yet I still leave it in for 5 minutes before washing it out. 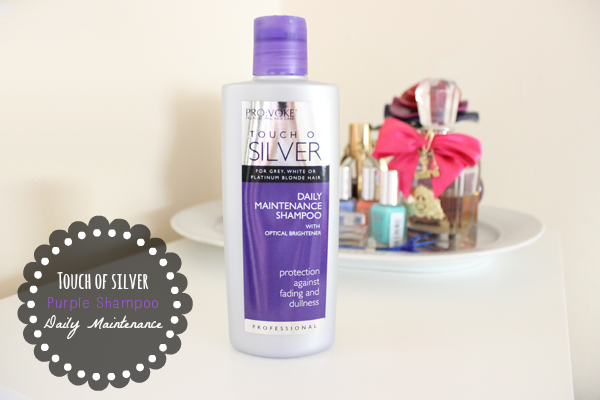 My next purchase will be their Silver Shampoo Weekly Treatment which is slightly stronger and more effective. For all those blondes out there, do remember to use hair masks and hair treatments once every two weeks. Being blonde myself, I try to keep my hair from getting ruined or damaged. WHAT IS YOUR BEST TREATMENT FOR YOUR HAIR? SHARE AND LET ME KNOW IN THE COMMENTS BELOW!